The FreeStyle portable oxygen concentrator (POC) makes its own oxygen in a compact package up to a 5-setting. 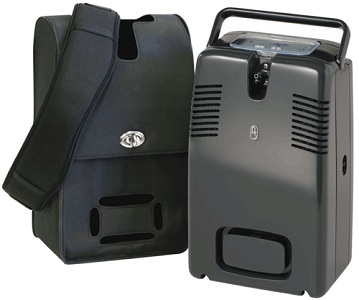 FreeStyle is a full-capacity portable oxygen concentrator that offers 5 pulse setting options. Both POCs utilize a uniquely efficient flexible pulse-flow delivery system, which enables patients to be as active as possible. The internal battery enables up to 3 or 3 1⁄2 hours of use between recharges. When more time is needed away from an available power source for extended activity, FreeStyle’s optional AirBelt™ is there to provide hours of extended battery duration. AirBelt connects easily to either unit and depending on the setting, can provide up to seven or ten hours of ambulation between recharges. Pulse Settings 1-5. Includes Machine, 1 Battery, AC/DC Power Supply, Carrying Bag, Shoulder Strap, Carry-all Bag, English Manual and 1 year full warranty.